The popular line of Troll toys – y’know, the ugly miniature dolls with large and wild hair that was all the craze for a while back in the 70s and 80s – don’t exactly seem like they’d make for quality film entertainment… but then again, they made four Transformers movies by this point, so I guess there’s always going to be a market for franchises based on children’s playthings. However, DreamWorks Animation’s musical-comedy adaptation of the toy line has irritated many by being everything that animated kid’s films nowadays should strive to be better than, at least according to the trailers. Who can forget that first teaser from earlier this year, which featured several redesigned Troll characters – whom I swear the filmmakers went out of their way to make as dissimilar to the toys as possible – grinding and twerking to the just-as-timeless classic “Watch Me (Whip/Nae Nae)” by Silentó? Needless to say, it was aggravating, and every bit of promotional material since then did nothing but seemingly confirm those horrific prophecies that Trolls would be a dated, condescending, lowest common denominator film designed to please kids with what was popular at the time of its conception, from its numerous celebrity voiceovers to its incessant use of well-known songs that make up its jukebox musical vibe. Having now seen the film, was I, and the rest of the world, right about my predictions? Well… it’s a LITTLE better than I thought it was going to be, but that doesn’t necessarily make it good. Put it this way, it’s not the worst family film I’ve seen this year, but that’s like saying one dose of laxative is better than two, or even three – whatever the case, you’re still going to end up with crap. The set-up is that a tiny race of multi-coloured trolls is being targeted by the evil Bergens, a group of monsters that believe they will achieve true happiness when they eat their tiny adversaries. After years of hiding, they rather idiotically give their position away whilst celebrating their twenty-year liberation from the evil monsters, and a majority of them are kidnapped as a result. 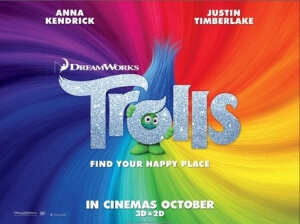 Their leader, the energetic and eternally peppy Princess Poppy (voiced by Anna Kendrick), decides to head to the Bergens’ civilisation to rescue her friends, and enlists the help of a grumpier and more paranoid troll named Branch (Justin Timberlake) to aid her on her mission. From there, it’s the type of buddy comedy you’ve come to expect from modern animated films like this, where two polar opposites must go on a journey together through a strange environment, come across a handful of characters along the way, learn a few life lessons, and inevitably warm up to each other by the end of their travels. Make no mistake, Trolls is definitely a cynical product, but why is it not as bad as I had feared? For one, the animation is very lively, bursting with colour at every corner and even with a small amount of creativity thrown in as well. As it can sometimes be with DreamWorks Animation, although they may be lacking in other areas they are almost always booming in the animation department, and in this case the colour scheme is definitely used to effective measures. Second, while there are plenty of celebrity voiceovers that have no reason to be there other than to get their name on the poster (I honestly didn’t even know Zooey Deschanel was in this film until her name showed up in the end credits, same with Gwen Stefani, Quvenzhané Wallis and others), most of them are fine even in the limited parts they have. Kendrick and Timberlake don’t have the best chemistry, but they at least sound like they’re having fun with their characters, which is better than just reading their lines off a script and that’s it. Finally, I know I said earlier about how the jukebox musical style it’s going with is corporate pandering at its worst, but there are honestly some times in the film where it’s irritatingly catchy, even for a bothered adult like myself. Its original songs, few though they may be, are fun as well; there’s a reason why Timberlake’s summer anthem “Can’t Stop The Feeling!”, which features in this film, became a huge hit this year. So after all that, Trolls is just a solid “meh”. Definitely not the worst family film you’ll see this year, but far from the best. Trolls can’t quite shake its obvious cynicism, from the achingly familiar plot to the often pandering soundtrack and pop culture references, but the colourful animation and peppy voiceover work keep it from being a complete waste of time for anyone over the age of eight.